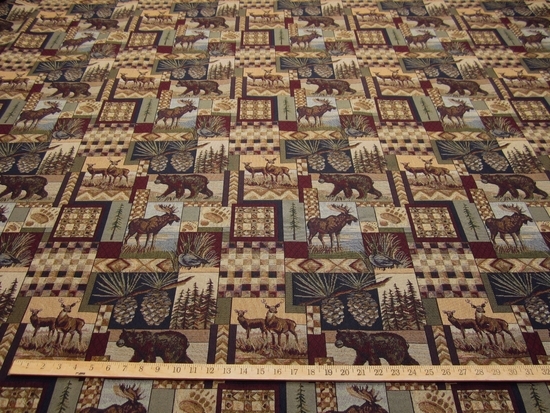 "Peters Cabin" northwest, deer, moose, bear theme tapestry fabric, colorway is stone. Colors are hazelwood tan, black, doric khaki green, wine, midnight blue, navy, gold, light brown, and stone. Repeat is 13.75"h. by 13.75"v. Pattern runs across the roll (railroaded). Width is 56" Colors are hazelwood tan, black, doric khaki green, wine, midnight blue, navy, gold, light brown, and stone. Contents are 55% cotton and 45% polyester. This is teriffic fabric for campers and cabins. It's also well suited for any sofas and chairs in the home. 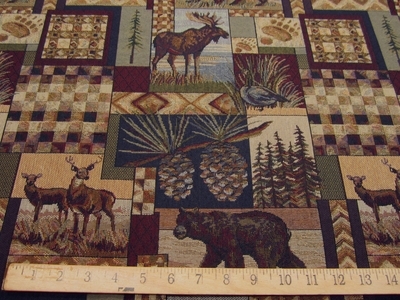 The width is 56" and your order will be in a continuous piece, the price is per yard.